Last night I finally got to attend BUG, the event that celebrates the evolution of music video. 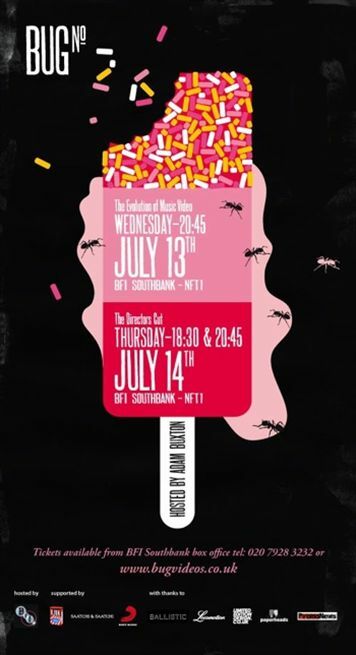 Hosted by Adam Buxton (of Adam & Joe fame), it takes place monthly at the BFI Southbank’s huge NFT1 screening room, showing new, innovative and classic videos from around the world – with a smattering of Buxton’s stand-up style comedy to bridge the gaps. In the Director’s Cut session we saw 14 in total, ranging from a crowdsourced Dennis Liu offering for Michael Jackson’s Behind the Mask to a disturbing Is Tropical from The Greeks (I love the song, but found that video a bit much). We also saw the second ever showing of Beardyman’s new track, Big Man, which I wasnted impressed by. I’ve seen him live, and his beatboxing is phenomenal. Him rapping though? It doesn’t work for me. I also quite liked the Chrome/Chris Milk (of The Johnny Cash Project fame) for superband Rome’s 3 Dreams of Black. It’s another interactive project using WebGL, and looks pretty cool. Standouts for me were the beautiful CANADA produced Holy Ghost for White Lies, and the impressive After for Moby, by Alberto Gomez (who won the Hello, Future video competition spearheaded by BUG and Saatchi & Saatchi). It’s pasted below. The visuals are quite stunning.